As the saying goes, you don’t know what you’ve lost until it’s gone. Once you’ve experienced the impact a quality buffer can have in restoring your tone, you’ll never go without one again. With a good buffer in the signal path, everything sounds like it is supposed to. Gear performs at the highest level possible, as it was designed and tested to do. If you’ve found yourself struggling with dialing in the perfect tone or just feel like you’re not getting the responsiveness you’re accustomed to, sliding a buffer into your setup may prove a magical tone altering experience. This concept was a revelation to me when I recently got my hands on the new MESA/Boogie HIGH-WIRE™ Dual Buffer and Line Driver. I knew my tone had been suffering as I could hear and feel what I was missing but I had no idea how easy it would be to get it back. Plugging guitars directly into amps, you hear & feel pure, raw energy. It was when I unintentionally disrupted this, by adding multiple effect pedals (and the cables required to connect them), that I noticed the excitement begin to fizzle. The top end was not as distinct and the overall feel was less lively. While my tone was acceptable, I could tell that I was missing out on that magical experience of plugging direct into an amp. A few players had mentioned to me that they had added a buffer to their pedalboard but no one had let on just how much of a difference this move could make. After experiencing this, I just wish someone would have said to me earlier, “YOU’VE GOT TO TRY THIS”! So, my intention in sharing my story is to do just that. If you’ve not experienced what a good buffer can do for your playing & tone, YOU’VE GOT TO TRY IT! I want to specifically reference the MESA HIGH-WIRE™ as the quality of the buffers employed in this design are simply better than what you may find in most buffered bypass pedals ( more on that topic here ) and there are features unique to its design that set it apart from other buffers. I’m just blown away with how it has brought back what I was missing in the tone & feel of my rig. Not only that but the elation felt over how my rig is performing has also sparked an excitement to play even more. How does the HIGH-WIRE bring back what you’re missing? There are actually two buffers in a HIGH-WIRE that can be employed in a first in / last out arrangement to create an effects loop that isolates the guitar and amplifier from the variation in tone and feel caused by the effects within that loop. The HIGH-WIRE’s input buffer converts your guitar’s high-impedance signal to low impedance and the guitar’s pickups respond to an impedance load in a similar way that they would when plugging directly into an amp. This is far different than the response from the load that the first effect pedal in your chain might provide. This can be critical because if your pickups were designed to plug into an amp with a 1Mohm input impedance but the effect pedal you’re plugged into actually has a 470Kohm (or less) input impedance, you’ll get a significant shift in the frequency response your pickups provide. At the end of your pedalboard's signal path, the HIGH-WIRE provides an additional buffer that functions as a line driver (lowering the signal impedance, which can often be increased by the output of certain pedals) to ensure the signal leaving your pedalboard, actually arrives at the input of your amplifier with minimal degradation, despite the length of cable.  From a performance/cost perspective, the HIGH-WIRE is an essential addition to my pedalboard. If you invest a significant amount of money pedals / effects, you want them to deliver peak performance. For this reason, the HIGH-WIRE is probably the most valuable pedal on my pedal board. Not only because it returns what multiple pedals and cabling have taken away, but because it also offers some really nice bonus features in the form of boost functions (a preset +3dB and a footswitchable variable boost of up to +22 dB), footswitchable muting and a tuner output that allows a tuner to be plugged in and on without sucking tone from the rig. If you want to mute while you tune, you can, by using the HIGH-WIRE’s footswitchable mute function. If you want to tune while playing, you can, because the tuner out is always on and it provides a buffered low impedance signal from its discrete Class A buffer circuit. A significant feature that sets the HIGH-WIRE apart from other buffers and takes this essential tone tool over the top, are the two switchable Boost options that are available. If you feel like you’re losing a bit of signal going into your amp, whether from cabling or just everything you’ve got connected or want to push the front end of your amp with a slightly hotter signal, you can bump the output at the tail end of your pedal board by making use of the +3 dB boost toggle switch. If you need to bump further or simply want to hit the amp’s front end even harder, the HIGH-WIRE provides a potentiometer that allows you to dial up to +22dB boost and footswitch this function on and off using the footswitch button. Here, you have the benefit of compensating for signal loss (should you experience that), use the feature for a fantastic sounding clean boost or simply even the levels between guitars you swap out throughout a night’s performance. Need to mute? The footswitch button not only provides access to the variable Boost feature but if held momentarily, will mute your signal. I can’t emphasize how much this single pedal has made a difference to how I hear my rig and feel its responsiveness. If you’re in a situation like I was (where the more pedals you add, the more lifeless the tone coming from your amp becomes), and you’re missing that spark of excitement that you get plugging straight into your amp, I would encourage you to pick up a HIGH-WIRE to see what it can do for you. YOU'VE GOT TO TRY IT!